This year, the Fed has raised short-term interest rates three times, pushing short-term interest rates to 2.25 percent and 10-year U.S. Treasury notes to 3.23 percent — all of which makes borrowing more expensive for buyers, companies, and investors alike. This month, the steady rise in interest rates has negatively impacted investor sentiment, causing the S&P 500 and NASDAQ to close with 1.14 and 52.50 deficits, respectively. Some analysts say worse is yet to come in the form of a market correction of anywhere from 10 to 20 percent (a correction is defined as 10 percent decline in a stock or index). So, how are real estate’s biggest companies positioned with a potential correction on the horizon? 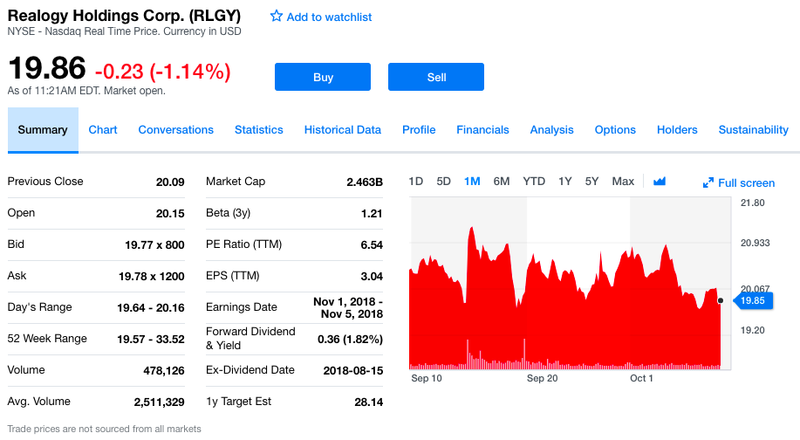 Since Sept. 10, Realogy’s price per share (PPS) has decreased 0.57 cents from $20.43 to $19.86, with a high of $21.24/PPS on Sept. 14 and low of $19.70/PPS on Sept. 19. During the same time period, Realogy continued its leadership shuffle, jumped into the iBuyer market, and paid $8M in a lawsuit over alleged kickbacks stemming from its now-defunct PHH Home Loans joint venture with PHH Mortgage Corporation. Although some analysts think the company’s share values are simply underpriced, others say Realogy has been hit hard by the housing slowdown, high commission payouts, and too much overhead. Most of all, a focus on new brokerage models is pushing venture funding toward companies such as Compass and Opendoor. As of Wednesday, Realogy’s stock had closed down 1.73 percent to $19.32 PPS — 0.38 cents less than its previous 30-day low of $19.70 on Sept. 19. Since Sept. 10, Zillow’s price per share has increased 0.07 cents from $45.03 to $40.10 — its lowest PPS in the past 30 days. A high of $47.53/PPS happened on Sept. 12. Zillow has been relatively quiet since its acquisition of Mortgage Lenders of America on Aug. 6, which sliced the company’s market cap by $1.6B the next day. Zillow CEO Spencer Rascoff said the drop in market cap and share values was “due to lowered guidance” for one of the company’s four marketplaces. But investors told another story, saying that said the integration of Mortgage Lenders of America alongside the company’s iBuyer moves posed too much risk for 2019. As of Wednesday, Zillow’s stock had closed down 2.81 percent to $38.34 PPS — $1.76 less than its previous 30-day low of $40.10 on Oct. 9. 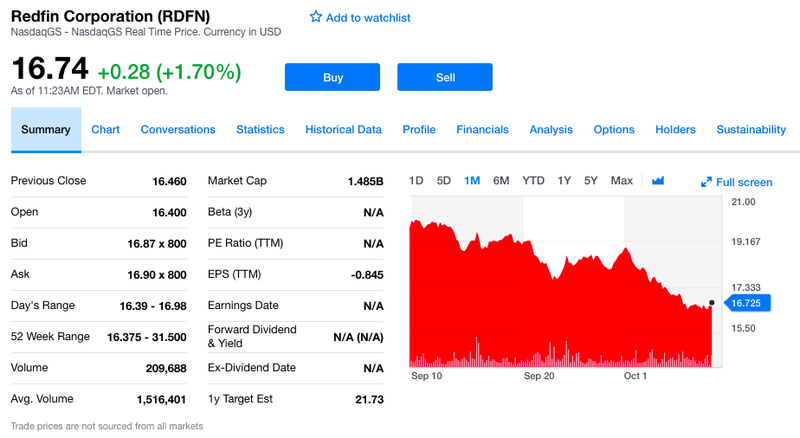 Since Sept. 10, Redfin’s price per share has decreased $2.98 cents from $19.72 to $16.74, with a high of $20.04/PPS on Sept. 10 and low of $16.46/PPS on Oct. 8. Much of the news from Redfin over the past month has focused on the launch of a new price estimate tool for off-market homes, continued expansion efforts for Redfin Mortgage, and a controversy surrounding the accuracy of Redfin Estimate after sudden, dramatic price hikes. Redfin CEO Glenn Kelman did lower the company’s Q3 forecast, citing “slowing traffic growth in a weakening real-estate market.” Despite that, investors are saying that Redfin is still a good investment. As of Wednesday, Redfin’s stock had closed down 4.75 percent to $15.44 PPS — $1.02 less than its previous 30-day low of $16.46 on Oct. 8. 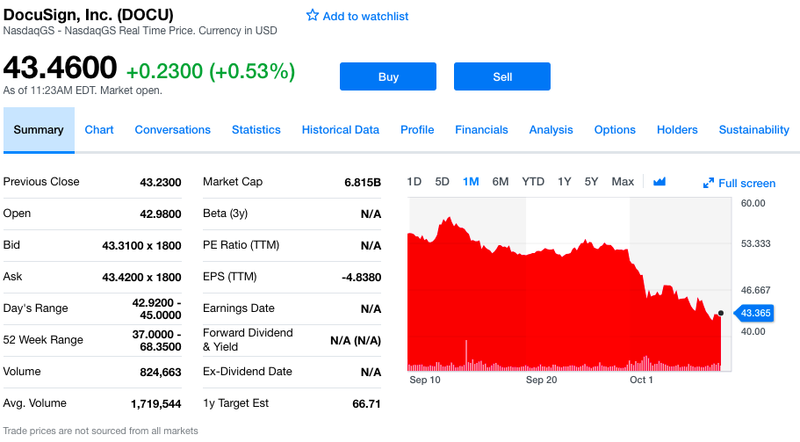 Since Sept. 10, DocuSign’s price per share has decreased $11.28 cents from $54.74 to $43.46, with a high of $57.03/PPS on Sept. 12 and low of $42.98/PPS at the open of today’s stock market. DocuSign surpassed Zillow Group’s market cap ($8.66 billion vs $8.56 billion) at the close of the trading day on Sept. 20 — a lead they’ve since lost ($8.096 billion vs $6.815 billion). 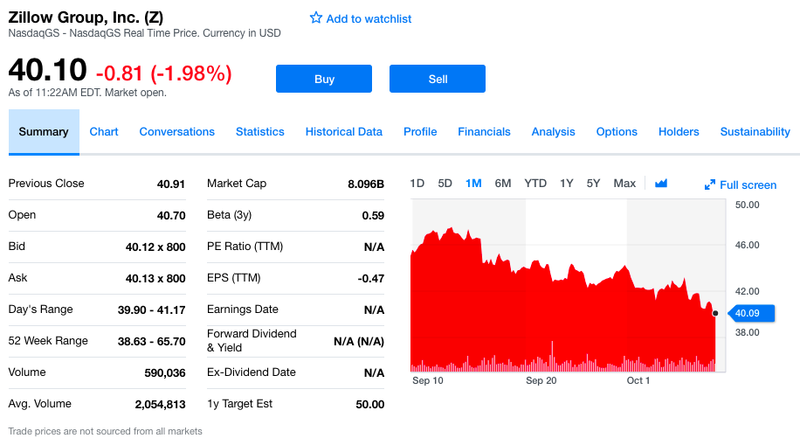 According to an analysis by Keith Noonan of The Motley Fool, DocuSign is heading into a two-month slump with shares continuing to fall in October after a 15.8 percent decrease in September, according to S&P Global Market Intelligence data. Noonan says “guidance that has underwhelmed some investors” may be to blame, but the company’s total revenue, earnings, and free cash flow have remained strong. As of Wednesday, DocuSign’s stock had closed down 2.19 percent to $40.60 PPS — $2.38 less than its previous 30-day low of $42.98 on Sept. 12. 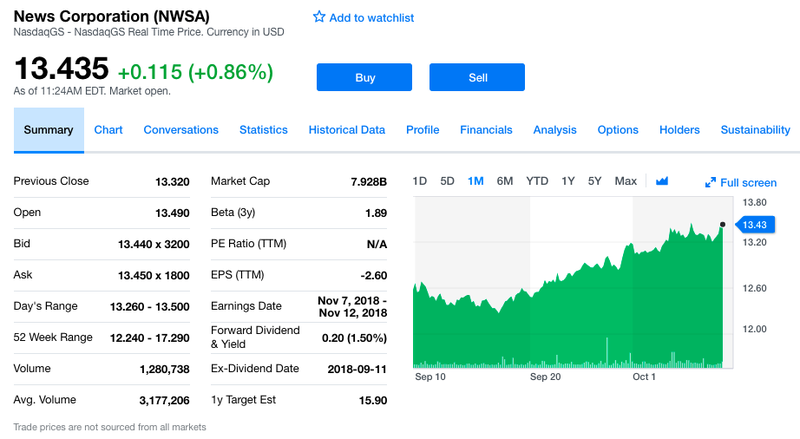 Since Sept. 10, News Corp’s price per share has increased 0.86 cents from $12.58 to $13.44, with a high of $13.46/PPS on Oct. 5 and low of $12.27/PPS on Sept. 17. In August, News Corp bought lead generation platform Opcity for $210 million a move that was followed by acquiring a brokerage license in Texas, where Opcity is headquartered. The company also experienced 19 percent year-over-year growth in its digital real estate services during Q4 2018, which includes Move’s realtor.com. As of Wednesday, News Corp’s stock had closed down 5.27 percent to $12.77 PPS — 50 cents away from its previous 30-day low of $12.27 on Sept. 17. 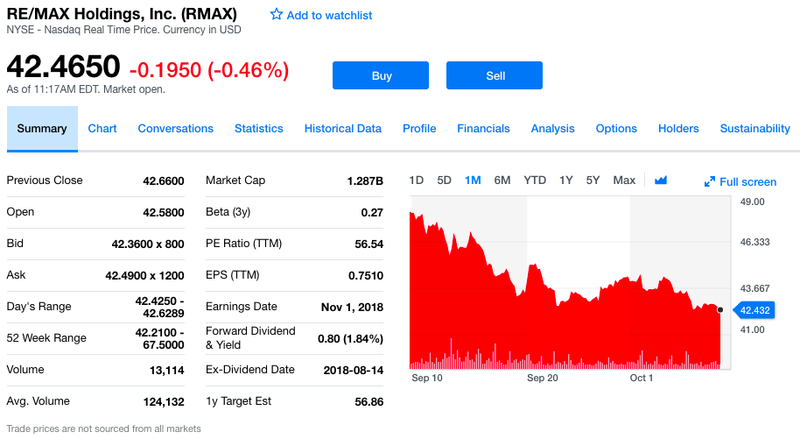 Since Sept. 10, RE/MAX’s price per share has decreased $5.59 from $48.05 to $42.46, with a high of $48.05/PPS on Sept. 10 and low of $42.65/PPS on Sept. 24. During the same time period, RE/MAX appointed a new CEO, expanded Motto Mortgage’s market share, and continued its battle with Keller Williams over who has the highest sales volume in the nation. But, the company had a rockier start to the year, with ethics violations by CEO Adam Contos and founder Dave Liniger. As of Wednesday, RE/MAX’s stock had closed down 3.16 percent to $40.76 PPS — $1.89 less than it’s previous 30-day low of $42.65 on Sept. 24.